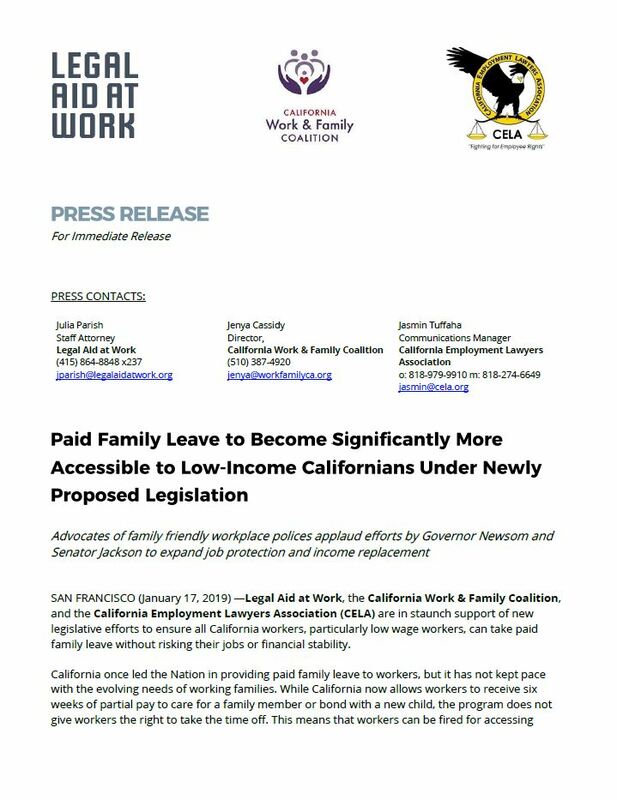 SAN FRANCISCO (January 17, 2019) —Legal Aid at Work, the California Work & Family Coalition, and the California Employment Lawyers Association (CELA) are in staunch support of new legislative efforts to ensure all California workers, particularly low wage workers, can take paid family leave without risking their jobs or financial stability. California once led the Nation in providing paid family leave to workers, but it has not kept pace with the evolving needs of working families. While California now allows workers to receive six weeks of partial pay to care for a family member or bond with a new child, the program does not give workers the right to take the time off. This means that workers can be fired for accessing these benefits—which they already pay for out of their own paychecks—unless they qualify for job-protected leave under an incomplete patchwork of other laws. The gap between the State’s paid family leave program and job-protection laws disproportionately effects low-wage workers, who are at the highest risk for losing their job when needing to access paid family leave. Governor Gavin Newsom has recently announced his intent to make paid family leave a reality for all Californians, most recently saying on Twitter that “Paid family leave isn’t a nice-to-have — it’s a must-have. And we’re going to make it happen.” Taking the Governor up on his call for action, Senator Hannah-Beth Jackson (D-Santa Barbara), who has been a longstanding champion for family-friendly workplace policies, has introduced SB 135 to make this promise a reality. Increasing the wage replacement amount in the paid family leave Program to ensure families can afford to take leave to care for children and family members. Study after study has demonstrated the benefits of paid family leave. For example, increases in the pay-rate of paid family Leave has been linked to more fathers taking leave; fathers who take paternity leave are also more likely to be actively engaged in their child’s care nine months after birth, more likely to read to their children at age 3, and a father’s engagement in their children’s care has shown to have lasting effects on the development of children, including greater achievement on assessments for language skills, cognition, and social development. Paid parental leave is also associated with an increased rate and duration of breastfeeding, decreased maternal depression, and increased use of life-saving preventative care, such as vaccinations. Further, paid family leave is good for businesses as well. Employees who are able to take protected leave to bond with a newborn are less likely to leave their jobs, which reduces the high costs of employee turnover for employers. 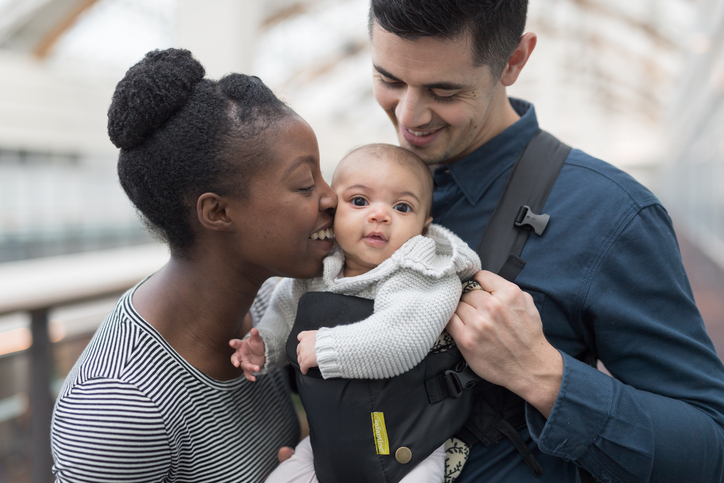 Perhaps unsurprisingly, then, small businesses have reported that paid family leave has had either a “positive effect” or “no noticeable effect” on productivity (89%), profitability/performance (91%), turnover (92%), and morale (99%). The California Work & Family Coalition is a groundbreaking alliance of community organizations, unions, and non-profits working together to pass new laws and promote work-family policies that help parents, caregivers, children and families thrive. We envision a world where all people have the time, resources, and support systems to care for themselves and their families and to lead meaningful, healthy, and happy lives. Our Mission is to organize communities to realize equitable, family-friendly workplaces and to expand the social safety net in California through policy, advocacy, and education. http://workfamilyca.org.